Sugar, spice and $22,500-worth of prize money. That’s what made up the Founders Inn and Spa and Regent University’s first-ever 10K Holiday Bakeaway. On Saturday, December 10, more than 100 registrants participated in the contest to find the best German chocolate cake, carrot cake and fruit pie in Hampton Roads. Registrants traveled from as far as Indiana, Pennsylvania and Texas to participate in the event. Each round of cakes and pies were judged by a team of six preliminary judges, including: Tracy Busching, co-owner of Twisted Sisters Cupcakes and Sugar Shack Café; Alice Cooke, owner of CakeAlicious and Food Network’s Cake Wars champion; Eddie Childers, director of research and development for Bake Fresh Company; Jordan Vallerga, Founders Inn sales manager; Priscilla Fritges, owner of Cilla’s Sweets; and three-time Regent alumnus, Hunter Davis ’16, vice president of CHCZ Corp. The final round of judging was determined by Vice President of Alumni Relations Ann Leblanc; Founders Inn Executive Chef Michael J. Bergen; weekend anchor for WVEC, Arrianee LeBeau; and Regent Founder, Chancellor and CEO Dr. M.G. “Pat” Robertson. 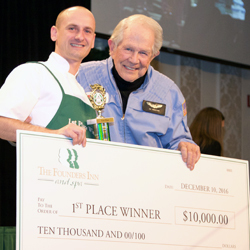 Robertson awarded the top contestant with a check for $10,000. Second place earned $7,500 and third-place earned $5,000. Taking first-place for the bakeaway was Debra Miller and Kamil Szpindowski from Incredible Edibles bakery in Virginia Beach, Virginia. The duo has been baking for 27 years, and together they plan to use the prize money to expand their shop. Second-place winner was home-baker Angela Parker. The win for Parker came at a timely moment, who plans to use her prize money to be able to see a brain surgeon. Emily Uperti Patti, owner of Moyock, North Carolina bakery, Patti Cakes, took home the third-place win.